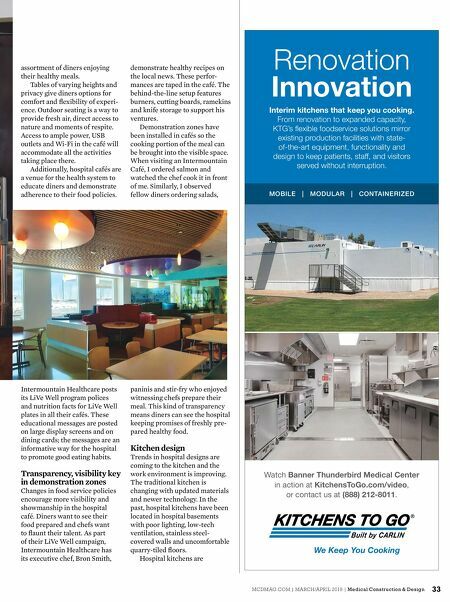 32 Medical Construction & Design | M A RCH /A PR IL 2018 | MCDM AG.COM Healthcare kitchen, dining trends promote wellness BY REBECCA WEIDLER Until recently, hospital food may have prompted memories of undesirable, fl avorless meals. Luckily these unpalatable postprandial visions are — or are about to be — a thing of the past. Health systems around the country are transforming their food service strategies and rethinking food policies to provide healthier eating options for hospital consumers and to reduce their environmental impact. Hospitals are providing menus that include antibiotic- free meats, locally grown produce and innovative recipes. They are removing candy, foods with added sugar, processed meats and sugary soft drinks. They are hiring executive chefs to bring in nutritious food op- tions and to remove foods that have been linked to mortality, shorter lifespans and over- all diminished health. These policy changes mean updates to infrastructure and ultimately to innovations in the design of kitchens and cafés. 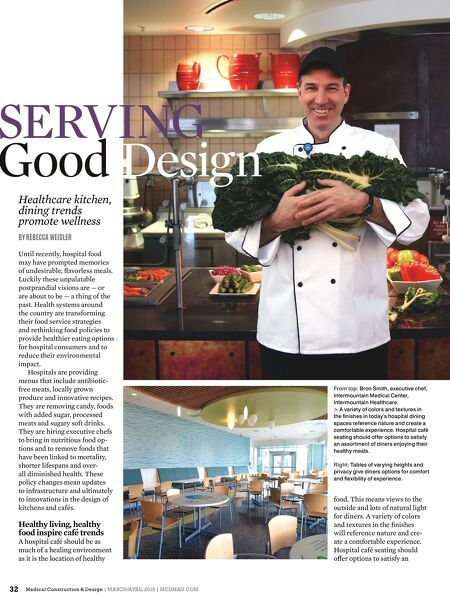 Healthy living, healthy food inspire café trends A hospital café should be as much of a healing environment as it is the location of healthy food. This means views to the outside and lots of natural light for diners. A variety of colors and textures in the fi nishes will reference nature and cre- ate a comfortable experience. Hospital café seating should off er options to satisfy an SERVING Good Design From top: Bron Smith, executive chef, Intermountain Medical Center, Intermountain Healthcare. > A variety of colors and textures in the fi nishes in today's hospital dining spaces reference nature and create a comfortable experience. Hospital café seating should offer options to satisfy an assortment of diners enjoying their healthy meals. Right: Tables of varying heights and privacy give diners options for comfort and fl exibility of experience.